CSIRO communicates with industry in a variety of ways, including through online and printed publications, the Australian SKA Industry Consortium (ASKAIC), public briefings and occasional site tours, targeted industry meetings and direct communication through ASKAP team members. The Australasian SKA Industry Consortium (ASKAIC) is a key Australian industry body supported by the Department of Industry and Science whose aim is to assume an influential, strategic and tactical role in supporting Australian industry's participation in ASKAP, the Square Kilometre Array and 'Big Data' projects. CSIRO is a member of ASKAIC. For further information, contact Mr Geof Heydon by phone (0419 203 993) or email. The Australian SKA Industry Capability Directory, on the ProjectConnect website, showcases a wide range of Australian companies and organisations with the expertise and excellence to support the development and construction of ASKAP and the SKA. Register your organisation and its capabilities by visiting the site and following the links. Organisations wanting to be involved with CASS-related projects are invited to register with AusTender, the Australian Government's procurement information system, where many of ASKAP's larger purchases will be advertised as Requests for Tender and Expressions of Interest. The international SKA project, headquartered in the UK, maintains its own industry engagement policies and procedures. Visit the site for detailed information, including a downloadable SKA Industry Engagement Strategy document. CSIRO is working with Australian industry to solve complex challenges involved in building the Australian SKA Pathfinder (ASKAP), and planning for the future international SKA telescope project. Industry participation has created strong collaborations with a variety of organisations, among them niche R&D companies, and resulted in commercial contracts with high-volume manufacturers, technology systems vendors, site services and installations firms, and energy and data transmission specialists. 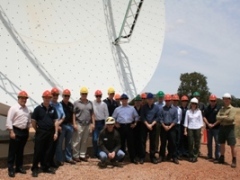 Read more about ASKAP's industry collaboration. For more information on CSIRO's ASKAP and SKA-related industry activities contact ASKAP Director Ant Schinckel.